I’ve never had an alcoholic beverage in my life, so I can’t begin to imagine why a martini should be shaken, not stirred. I’m not even sure what’s in a martini (gin, maybe? And something else, as well, would be necessary to qualify it as a mixed drink. Also, maybe an olive. ), but I do know that it is the drink of choice of the world’s best known secret agent, and that he’s very particular about the way it’s mixed. So if you know anything about James Bond, you already know about the martinis. And you know about the custom-fit tuxedos, the exotic locales, the fast cars, and the license to kill. You know he kills bad guys with impunity and sleeps with dangerous, beautiful women (all in the service of king and country, of course). Since most everybody knows most everything I just outlined, most everybody fits into one of two categories: either you like James Bond films or you don’t. You watch them or you don’t. 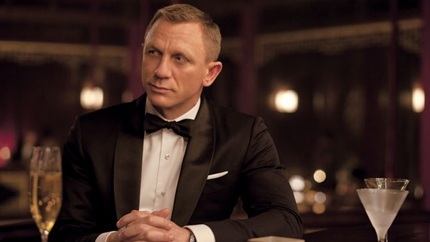 Skyfall, the latest James Bond installment, however, may give you pause. All of the above-mentioned things are still there, but this film is dramatically different from every other Bond installment. Previous incarnations of 007 have always leaned toward camp, tongue so far in cheek that it sometimes slipped out of the mouth altogether and just looked silly. Outrageous super-villains bent on taking over the world and femme-fatales so rife with innuendo that you were constantly reminded that this was some sort of grownup/schoolboy/comic book/fantasy mash-up that was almost an action movie. Sequences were often brightly lit, and even the fight scenes had a comically lethargic pace, with groups of bad guys taking turns with our hero, always allowing him just enough time to get hold of that ink pen/laser beam or his exploding cuff links. And for some, that is precisely what they liked about James Bond films: predictable pretend time with grownup themes. The previous two Bond films with Daniel Craig had already set the stage for this one. They were clearly committed to rebooting the franchise, pruning the character back to his roots and starting over in Casino Royale. Craig’s second effort, Quantum of Solace, was hampered somewhat by a writers’ strike in Hollywood, but it nonetheless continued in the same vein. But it was early buzz about Skyfall that really made me realize they were serious about changing the direction of the franchise when they announced that Roger Deakins would be the cinematographer. If you’re a film geek like me, you may already know Roger Deakins, whom many (myself included) consider the greatest living cinematographer. Actors get all the publicity because they’re the ones we see, the ones who entertain us in front of the camera. Directors sometimes gain notoriety because their films gain particular attention or win awards, or they’re very public people who are out promoting their films and their causes and so on. They give vision and, obviously, direction to the project. But it is the cinematographer, they guy behind the camera, who gives a movie its look and feel. He determines what lenses to use and how to light each and every moment that is captured on film (or the digital equivalent). So you may not know Roger Deakins by name, but you almost certainly have seen his work: The Shawshank Redemption, O Brother, Where Art Thou?, Fargo, The Assassination of Jesse James by the Coward Robert Ford, Doubt, True Grit, A Beautiful Mind (to name a few in a rather long and impressive resume). So my point is not that the camera work alone makes this movie different or better, but it helps tell a different kind of story altogether. You don’t bring in one of the best directors of photography in the world if you’re going to shoot the same old goofy spy movie you’ve been shooting for 50 years. What director Sam Mendes and writers Neal Purvis and Robert Wade figured out was that they could take the best parts of a well-loved and well-worn franchise and graft in the best lessons learned from the Jason Bourne series, creating a fantastic new direction for this character to grow and develop. The casting is superb, and the acting is all top-shelf. Javier Bardem plays a disturbingly believable psychopath with a festering grudge that drives him to do some horrible things, but they never even begin to approach the cartoonish, take-over-the-world scenarios of yesteryear. He is scary for all the right reasons, and it is never a foregone conclusion that Bond will walk away unscathed or even victorious. For long-time fans of the franchise, there is some wonderful backstory laid out that gives us insight and understanding, but newcomers will not feel left out or conclude that they need to go back and watch the last 20 or 30 movies to catch up with the storyline. Skyfall is action-packed, suspenseful, and never predictable. The storytelling is tight, the acting is exceptional, and the look and feel of the film is amazing. It is well over two hours but you’ll never glance at your watch. Skyfall is Bond. James Bond. And in my opinion, better. Just better.